Continuing with the theme of World Exploration, Today I want to discuss Florence Italy. 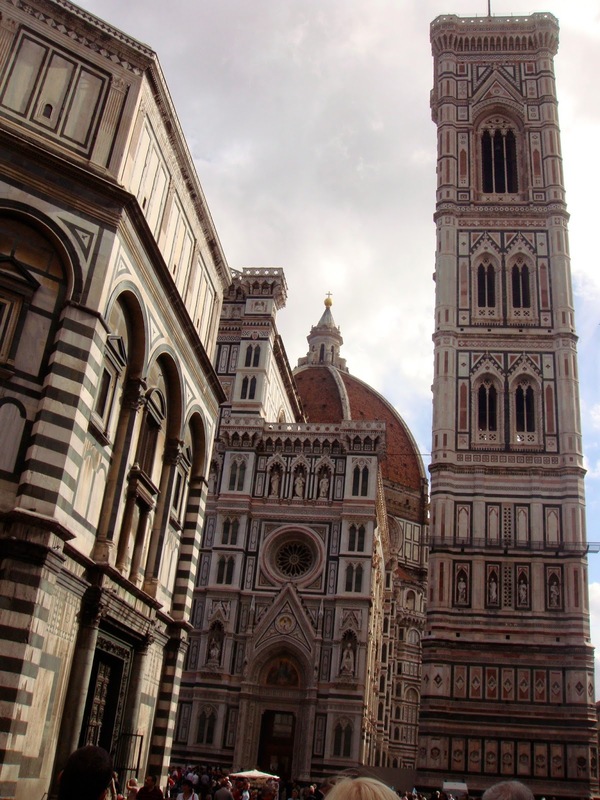 Florence is the capitol City of the Tuscany Region of Italy. In my opinion, it is one of my favorite places in Italy. I have had the opportunity to visit the city twice in my lifetime, and both were very enjoyable experiences. If you are ever on a western Mediterranean Cruise, this is a place for a walking tour. 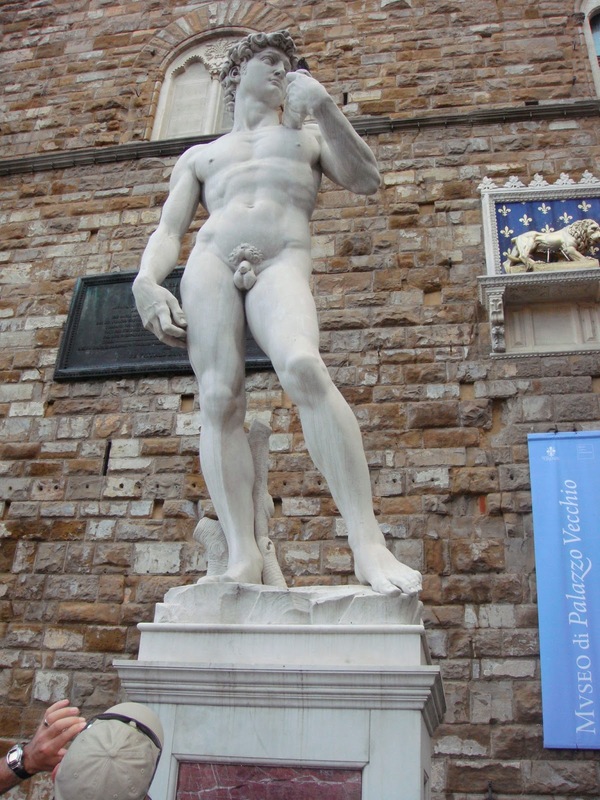 David, considered one of Michelangelo's masterpieces is housed in one of the many museums in Florence. During our walking tour, we were only able to see a replica still on display outside. Located in the Palazzo della Signoria. This square is full of famous replicas. Another Piazza is the Piazza de Santa Croce, which is right in front of the Basilica of Santa Croce. (pictured to the right). The walking tour that Sunshine and I took, lasted about 2 hours and we hit all the major spots in town. A brief history was presented to us about the city and the different sites we saw. The city is crowded on the day the Cruise lines are there, however, it was still an enjoyable experience. Another famous spot in Florence is the Ponte Vecchio. 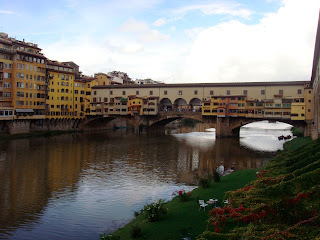 This bridge covers the river Arno. Apparently the people of Florence have had kind of a love/hate relationship with the river. It has been a key part of the history, provided a path for commerce which has helped the city to grow and become wealthy. At other times, it has flooded and caused damage to the city. The bridge is loaded with shops, for gold mostly. This is a must see in the old town. This bridge has been flooded out many time. But the people keep coming back. The A to Z challenge is moving right along. Some visitors may be wondering all the pictures I share do not show more wide angle shots. It is because all the photos I share, I took myself. While walking around the different places. It is more likely what will be seen while you are there, unless you take a helicopter tour. A year ago I was totally hooked on the movie Under the Tuscan Sun and watched it a couple times a week. I loved the idea of taking an old villa and restoring it, and the relationship of the owner with the workers. So fun! I have the book too, but haven't read it yet. Excellent post and great pics! I have yet to visit Italy other than quick plane stopovers.